AKA: - Al-Ain Alps, Swiss Mountain, The Grey Mountain. Altitude: - Camp-site is at 600m, summit is at 1100m. Difficulty:- Easy walking and easy scrambles up the gullies. Take care if you choose the alternative descent because there are some loose, steep bits that you need to avoid. Chirri dog factor: - Not many goats or donkeys, but those bat things are weird. A bit sore on my paws on the way down, and not too much shade on a hot day. Dangers: - Don't take the alternative way down unless you are confident of your route-finding. Wildlife and plants: - Caralluma Arabica in abundance, and some fascinating bats in the cave. Navigation: - Ascent is very easy to follow. All waypoints are WGS84 datum. 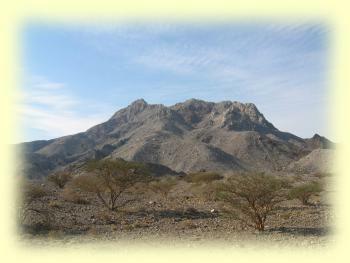 Jabal Ghawil is located amidst the Omani mountains, about 50 kilometers north-east of the city of Al-Ain. Its distinctive light-grey colour, which has led some some people to nick-name it the 'Swiss Mountain' or the more imaginative 'Al-ain Alps', makes it stick out like a sore thumb against the much darker opheolitic outcrops surrounding it. The color makes it a great landmark. It also makes it easy to find! 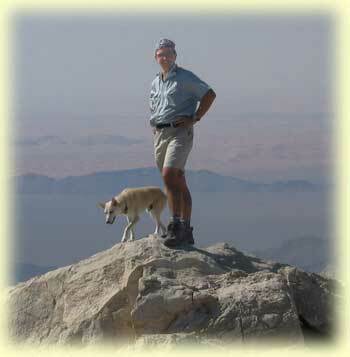 I only recently stood on Jabal Ghawil's summit, although it's been helping me navigate for many years. While exploring the dunes east of the Al-ain to Al-Hayer highway, or the wadis to the east of the mountain itself; Jabal Ghawil has dutifully fulfilled the role of waymark, and has saved me from getting lost on many occasions. I knew it as 'The Grey Mountain', and although I've always been grateful for its help in showing me the way, I was never really driven to climb it. From a distance, Jabal Ghawil is just not pretty; it looks more like a slag heap at a cement works, than a majestic mountain beckoning you to scale its slopes. I have to confess that I was wrong for all those years, because now that I've climbed the Jabal, I've discovered that it has hidden beauty. Just as you shouldn't judge a book by its cover, so it is with mountains; not only do they appear differently from different angles but also from different distances, and this one is a whole lot better closer up! First, I must tell you the story of how I came to climb Ghawil. Many people contact me regarding information on my web-site, and I'm always glad to receive feedback. What is especially good is when someone tells me about somewhere new. In this case it was an email from Chris Tourenq; thanking me for the information on the web-site and paying me back with information on Ghawil. Chris didn't know the name of the mountain, but was able to give me a GPS location and a rough description of his climb. From then on it was inevitable that I should have to go and take a look for myself. We finally got to go in January this year (2004). Here is an excerpt from my diary: "Had a brilliant camp and fabulous climb. Cool on the summit at midday up at 1,100m. We came down via a different route, making a nice circuit. 12° C at sunrise!" Short and sweet, I know, but it reminds me of just how much we enjoyed that day and of course how pleasant it is to climb when the temperatures are so comfortable. We camped on the east flank of the mountain which gave me a good close up view and left me in no doubt about the route we would take on the climb the next morning. For me, reaching the top of a mountain is always less important than how it's achieved. Half the fun is finding a good route, and in case you are in any doubt about what makes a route good, then I'll explain that a good route is one that gets you to the top but at the same time takes your mind off the inevitable hard work of climbing. Slogging straight up a mountain whose summit never seems to get any closer is not all that much fun; even though it's sometimes unavoidable. Choosing a route that winds its way up narrow gullies to the occasional pass with rewards of fantastic views, and which then finally delivers you on the summit, seemingly much more easily than you imagined, is my idea of hiking heaven. Luckily, because you can't always guarantee these things, our route up Ghawil turned out to be just great. The route took us up a series of short climbs each ending at a col, providing ever more spectacular views, and a welcome excuse for a rest. To add to the interest there was plenty to see on the way too. On the climb up from the second col, Chirri dashed off past me, and up into a cave about 50 meters away. What then ensued can only be described as pandemonium; blood-curdling screeches were emanating from the cave that made me fear that he'd caught hold of some poor creature and was doing it to death. Now, Chirri is not normally a violent dog, but he is descended from a wolf and for all I knew, instinct had taken over, and he was making a kill for the pack! All very well, but we had plentiful supplies of fruit and munchy bars for our summit snack, and definitely no need for fresh meat or a bone to chew on. As I approached the cave things didn't look good; there were bunches of feathers and a detached bird's wing scattered around. When I finally entered the large shallow cave, I found Chirri had merely disturbed a family of about twenty bats. He was barking and trying to climb the guano-covered walls, they were flying in and out of the cave emitting high pitched squeaks. Fortunately the remains of the bird that I'd seen were nothing to do with Chirri and were probably left by a fox. Chirri eventually came to terms with the fact that the cave walls were un-climbable and the bats realised that they were quite safe in their lofty crevice. By the time Liz arrived, relative peace had returned to the mountain. We eventually reached the summit at midday, and despite the overhead sun, it was quite cold. The air was very clear and we could make out Jebel Hatta and Jebel Sumeini to the north, and Jebel Hafeet and Jebel Qatar to the south-west. We could see over to Buraimi and Al-Ain and make out Jebel Jifra in amongst the dunes. Looking over to the east we had great views of the impressive wadi systems near Juwaif. At the foot of the mountain to the south-west we could see where the grey rock of Ghawil butted up against the dark rock of the small hills to the south. Jabal Ghawil drains into these hills and has formed some interesting wadi systems. One particular wadi, the largest one, looked like it would make a good hike and you can read about that here soon. From the main summit, and across a saddle to the west, you can see another summit. Instead of making our way over to that, we decided to make a circuit of the eastern side of the mountain by descending the southern side to a large flat area. We then made our way down the gullies to the east; finally returning to the camp by walking north along a track along the eastern side of the mountain. The descent was a little tricky in places but when I repeated it a couple of months later I found a slightly better route. The easy track back to the camp is a welcome break from the concentration needed to safely descend the gullies. We arrived back at the car in good time for a rest before making our way home. We left with the feeling that we'd definitely be back. We returned in March to repeat the climb with friends, and I returned in late May, to explore the wadis to the south. If you are coming from Abu Dhabi or Al-Ain, then you need to go through Buraimi in the direction of the Sohar road, and then just past the Buraimi Hotel, you turn left towards Mahda going past fossil valley and Jebel Qatar. After passing Jebel Qatar on your right and before reaching Mahdah, you turn left towards wadi Sharm, and then go straight at the next roundabout towards Juwaif. After crossing wadi Sharm you turn left at the next major junction in the direction of Sumeini instead of continuing on to Juwaif. You should now see the grey mass of Jabal Ghawil on your left. You'll find the turn off to the camp on the left at 1.8km from the junction. This is at waypoint N24°33.317´ E56° 3.080´ Take care when turning off the tarmac because you are in a dip and can't see oncoming traffic. If coming from Dubai you can approach from the north by taking the road to Hatta and then take the road leading south towards Mahda which starts as the Hatta road passes Jebel Rowda. This is about 18km beyond the roundabout at Madam; there is a petrol station at the junction. Continue south on this road towards Mahda, passing Jebel Sumeini on your right. After 26km on this road you'll reach a junction of roads and tracks but just continue on in a south-east direction towards Mahdah. The track to the camp site is on the right at waypoint N24°33.317´, E56° 3.080´ and about 15km from the junction. The camp is at waypoint N24° 33.725´, E56° 2.686´ and to get there from the tarmac head directly towards the mountain on a good track going north-west. There are a number of tracks going off in different direction but ignore these. In less than 1km you should come to a shallow wadi where the track appears to continue north along the right side of the wadi. If you continue along there you'll come to a dead end and have to turn back, but if you take a good look at where the road first meets the wadi you'll see a bumpy track which crosses the wadi. Go across the wadi and head north along its west bank to the camp which is a flat area on the right. There are other options for camping here depending on how much space you need. Round trip about 4.5hrs with time at summit for lunch. From the campsite you can drive a little further north on the track squeezing between a couple of acacia trees and over a couple of rises until the track peters out. Here you can park the car out of sight and get a little shade from a couple of trees. Leave the car and walk along the wadi heading north and then north-west until you get to a point where the wadi splits. Here you can see the branch to the left goes up the interface between the light rocks and the dark rocks. Don't take that branch but head up the next gully to the right so that you have a ridge on your left between you and the main mountain. There are vague goat and donkey tracks to follow until you reach a col with great views into wadi Sumeini. You should get here in under 30 mins. On the way up here and around the col look out for the khanasoor plants which are abundant in the area. 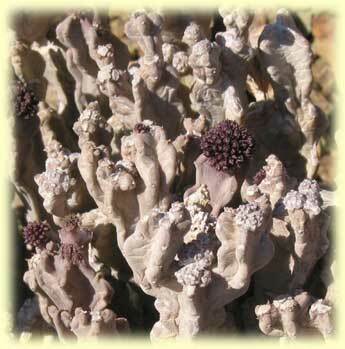 These are cactus-like, rubbery plants, with thick grey-green stems about 30cm long. You may see small maroon coloured flowers on the ends of the tips, with a shiny white spot in the centre. This is Caralluma Arabica, a member of the milkweed family and used by local people as a medicine. The tips are apparently useful in treating indigestion so if your breakfast is giving you problems then you know what to do! From the col, turn left and climb up and over the ridge through a small notch and then descend to a flatish area which is the top of the other branch of the wadi. Here you need to climb up the rough boulder-strewn gully ahead of you to the south west. After another 20mins or so you should see the bat cave in the cliffs to your right. You can make a detour to it if you want. The last time I visited it there were only a couple of bats in residence as opposed to the twenty or more on my first visit. Continue up the gully to the second col which is reached in another 10 mins. If you continued on here you would just descend, so turn right and climb north-west up an easy gully to a small notch (third col) on the ridge, in just a few minutes. Here you must scramble up left and onto the ridge proper. You should now see the summit just along the ridge in a west-south-west direction. Make your way along the ridge dropping down from time to time to tracks along the north side, and you should reach the summit in about 35mins. When you approach the summit it looks like you'd need to do a bit of rock climbing to get to the top because the face in front of you appears pretty steep. Just continue on past on a path on the right of the summit and look out for cairns that previous visitors have left. Your aim is to go a little way past the summit and then make an easy climb left up a gully. Once on the top walk back along the ridge up to the summit. You'll know you are there from all the goat droppings! If you're lucky and it's a clear day, you'll have a wonderful panoramic view of the surrounding countryside. Take a good look at the wadis in the darker rocks to the south. I'll be writing about exploring that area on another page. You should also be able to make out further outcrops of the light coloured limestone running off to the north-east. If you sit at the summit cairn facing the other subsidiary summit 30metres away to the west, then you should have steep cliffs falling away to your left. If you look down there a bit to the right you should see a flat area which can be reached by descending west down a gully to the right of the subsidiary summit and then descending on a traverse round to the right until you can find a gully to your left which leads down to the flat area. Sounds a bit complicated, I know, but you should be able to see the way down quite clearly. Just don't try to head left down to the flat area too soon. If in doubt, head back to the camp the way you came and don't risk a tricky descent. From the flat area you have to work your way down and across the gullies to the plains below where there is a track leading back to the camp. Both ascent and descent should each take you about 2hrs with stops. Give yourself 4.5hrs for the round trip, giving time on the summit to admire the views and to take lunch.